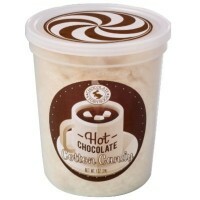 Cozy up for the day next to this sweet treat inspired by everyone's favorite chilly-day drink. 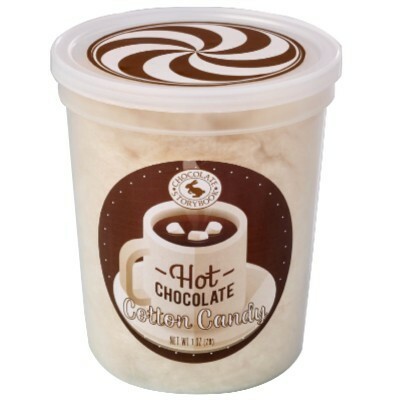 The melt-in-your-mouth texture of cotton candy combined with the luxuriously sweet and rich flavor of hot chocolate combine to give you a satisfying snack that surprises your taste buds. Sugar, natural and artificial flavors, maltodextrin, modified food starch. Manufactured in a facility that also processes tree nuts, peanuts, egg, soy, milk, wheat. Contains GMO. Nutrition facts (for 100g): calories 382Kcal, total fat 0g (saturated fat 0g), total carbohydrate 97.1g (sugar 97.1g), protein 0g, salt 0g.